Breathtaking design meets unrivaled craftsmanship in the KOHLER Tailored vanity collection. No detail was overlooked in the meticulous crafting of this collection, from the premium hardwoods to the specially designed hardware and vanity tops, all available in an array of finishes to create your own look. This Marabou vanity brims with country charm for a timeless look that is a true classic of American design. Complete your vanity with a coordinating top, hardware, and accessories from the collection. With a style evoking cherished antique heirlooms, the Alberry 24-inch wood vanity cabinet takes its cues from Colonial-era furnishings. Traditional turned-post legs evoke a handcrafted feel, complemented by the arched base and straight lines of this classic American design. Express(TM) installation makes it easy to bring this bathroom vanity home and set it up in a matter of minutes. With a style evoking cherished antique heirlooms, the Alberry 36-inch wood vanity cabinet takes its cues from Colonial-era furnishings. Traditional turned-post legs evoke a handcrafted feel, complemented by the arched base and straight lines of this classic American design. Express(TM) installation makes it easy to bring this bathroom vanity home and set it up in a matter of minutes. Evoking the cherished feel of an heirloom antique, the Alberry vanity takes its design cues from much-admired Colonial furnishings. The well-built, solid nature of this piece, combined with the straightforward lines of the doors and arched base of the facade, epitomize this early American style. The lack of additional ornamentation serves to highlight the curves of the traditional turned post legs. A lustrous cinder finish adds polish and finesse to the piece. Also available in store by special order only see store for details. 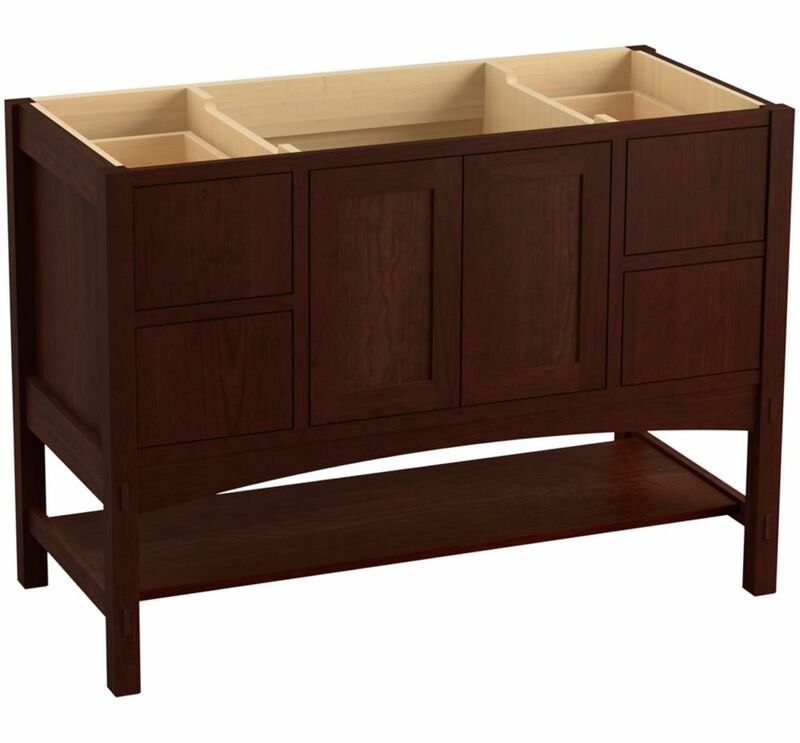 Marabou 48 inch Vanity With 2 Doors And 4 Drawers, Split Top Drawers, Cherry Tweed Breathtaking design meets unrivaled craftsmanship in the KOHLER Tailored vanity collection. No detail was overlooked in the meticulous crafting of this collection, from the premium hardwoods to the specially designed hardware and vanity tops, all available in an array of finishes to create your own look. This Marabou vanity brims with country charm for a timeless look that is a true classic of American design. Complete your vanity with a coordinating top, hardware, and accessories from the collection.